Car Pal national car buying services has been in business for just over a year and a half and never successfully completed a car purchase in Florida. If we had a Florida car buyer, we wound up purchasing out of state because if the prices were not too high, then the trade in values were way too low. Car Pal had the great fortune of finding TWO separate car dealers in Florida this week that are true bell ringers for service. The first is O’Steen Volvo in Jacksonville Florida. 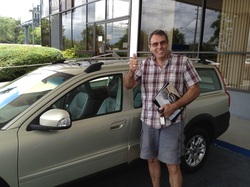 Glenn Guiler was our fine salesman and he was backed by his GSM, Kevin Winch. Talk about making things professional, easy and rolling out the red carpet for the Volvo client. They rate a perfect 10 in Car Pal’s dealer rater system! Most impressive to us and to our client, Angelo (featured above with his gorgeous new to him 2007 Volvo XC70), was the fact that when Glenn was off, his GSM, Kevin, took over and completed everything that was necessary for the car deal so that Glenn didn’t have to share the sale with a co-worker. That was nice for Glenn, but even nicer for us, because we were dealing with the top guy, and not someone who didn’t know what was going on. While we are giving our favorite car dealers great accolades, we need to be sure to mention David Waldock at Rusnak BMW in Los Angeles, California. Though he was super busy (as he should be, he is their top salesperson! ), he always took our calls. This would be in stark contrast to the fellow we worked with at Princeton BMW in Princeton, NJ. He said he was too busy to take our calls, so doing business with that dealership was a complete nightmare. It was worth it for Car Pal and for our client in Chicago to deal across the country just to get this kind of supreme customer service that we received from David Waldock. At this very moment, Car Pal is working on a deal for Gio Iuculano of Winchester Dental Group. This will be a Chrysler lease. It appears that Tom Terry, Mazda sales manager of Naples Dodge, Chrysler, Jeep and Mazda in Florida has given us such a stunning figure on the Town and Country lease that we will not have to consider any other car dealership as competition! That is the BEST kind of service Car Pal and Car Pal’s car buying service clients can ever hope or dream for. Tom Terry is one of the rare GSM’s who truly understands that if he wastes our time, we will simply go elsewhere.